The sizes of the official AKC recognized Poodle breeds are determined by height, not by the weight. The Miniature Poodle must be over 10 inches and 15 inches or less at the highest point of the shoulder. Any Poodle which is over 15 inches or is less than 10 inches at the highest point of the shoulders cannot compete in the AKC show ring as a Miniature Poodle. Extensive grooming is needed if the dog is to be shown. Poodles must be bathed regularly and clipped every six to eight weeks. Clean and check the ears frequently for wax or mites or infection and pull out hairs growing inside the ear canal. The teeth need regular scaling. Since the coat does not shed it needs to be clipped. There are several different types of poodle clips. The most common for pet owners is an easy care clip called a "pet clip", "puppy clip" or "lamb clip" where the coat is cut short all over the body. Popular show clips are the English saddle and the Continental clip where the rear half of the body is shaved, bracelets are left around the ankles, and pom-poms are left on the tails and hips. The AKC standard allows for a dog under a year old to be shown in a show style puppy clip which has special requirements such as a pom-pom on the end of the tail. Other clip styles are the modified continental clip, town and country clip, kennel or utility clip, summer clip, and the Miami of bikini clip. Poodles shed little to no hair and are good for allergy sufferers. The Poodle has been known throughout Western Europe for at least 400 years and are depicted in 15th century paintings and in bas-reliefs from the 1st century. The subject is controversial of where the dog was officially developed and no one really knows the breeds true country of origin. France has taken a claim on the origin, but the AKC gives the honor to the Germans where they say it was used as a water retrieval dog. Other claims have been Denmark, or the ancient Piedmont. What is certain is that the dog was a descendant of the now extinct French Water Dog, the Barbet and possibly the Hungarian Water Hound. The name "Poodle" most likely came out of the German word "Pudel," which means "one who plays in water". The "Poodle clip" was designed by hunters to help the dogs swim more efficiently. They would leave hair on the leg joints to protect them from extreme cold and sharp reeds. The hunters in Germany and France used the Poodle as a gun dog and as a retriever of waterfowl and to sniff out truffles laying underground in the woods. The French started using the breed as a circus performer because of the dog's high intelligence and trainability. The breed became very popular in France, which led to the common name "French Poodle", but the French people actually called the breed the "Caniche," meaning "duck dog. The Toy and Miniature Poodle varieties were bred down from larger dogs, today known as Standard Poodles. In the 18th century smaller poodles became popular with royal people. The three official sizes are the Toy, Miniature and Standard Poodle. They are considered one breed and are judged by the same written standard but with different size requirements. Breeders are also breeding an in-between size called a Klein Poodle (Moyen Poodle) and a smaller Tea-Cup Poodle. 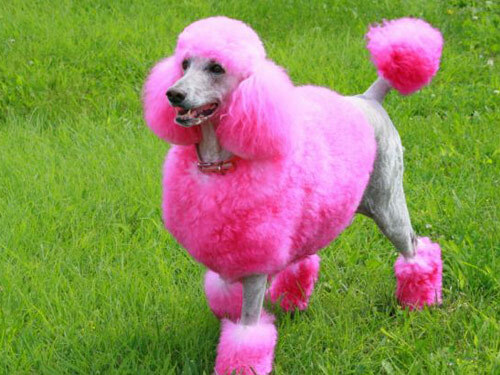 Some of the Poodle's talents include: retrieving, agility, watchdog, competitive obedience, and performing tricks.